Special Solari Report – American Suicide: Proposals for Constitutional Amendments & Convention with Edwin Vieira, Jr.
America’s sovereign finances have been operated outside the law for some time. Since fiscal 1998, the Federal Government has refused to publish audited financial statements and has reported over $11 trillion in undocumentable adjustments. Solari Report subscribers have heard for years about black budgets, hidden systems of finance, trillions in money going missing from the US Government accounts, all constituting a “financial coup d’etat. Clearly, there have been significant violations of provisions in the US Constitution and law related to management of resources and assets. You would expect that we would hear a growing chorus of both conservatives and progressives insisting that Congress comply with the law with respect to the management of our finances. Where is our money? Which mechanisms should we use to get it back? However, that chorus has not spoken up. Instead, we see a push for Constitutional amendments and conventions. This push raises many questions. If we will not enforce the Constitution, why the rush to change it? Why do so in a process that could be hijacked? 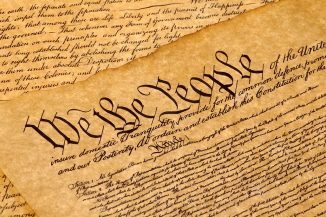 If you look at the extraordinary sums of money, dirty tricks and covert operations used to push through tort reform, Common Core or mandated vaccines at the state level or to destroy my community wizard software tool or other attempts to ensure proper accounts and reporting, the push to change the Constitution seems mighty suspicious. Are the people who have shifted all the money out of government accounts hoping to make sure that the Constitution can not be used to enforce, even get the money back? What is the real agenda here? To help me sort through these questions and dig into the very real risks, I asked attorney and Constitutional scholar Edwin Vieira to join me for a Special Solari Report on the current push to fiddle with the powerful covenant that protects us all. What does it mean to us and why should we make sure our Congressmen and state legislators are focused on enforcement of the Constitution, rather than changes? If you don’t know about Edwin Viera, you should. Vieira holds four degrees from Harvard: A.B. (Harvard College), A.M. and Ph.D. (Harvard Graduate School of Arts and Sciences), and J.D. (Harvard Law School). For more than thirty years he has practiced law, with emphasis on constitutional issues. In the Supreme Court of the United States he successfully argued or briefed the cases leading to the landmark decisions Abood v. Detroit Board of Education, Chicago Teachers Union v. Hudson, and Communications Workers of America v. Beck, which established constitutional and statutory limitations on the uses to which labor unions, in both the private and the public sectors, may apply fees extracted from nonunion workers as a condition of their employment. You can find Dr. Vieira’s articles at EdwinVieira.com and his books here, including my favorite, Pieces of Eight: The Monetary Powers and Disabilities of the United States Constitution. His lecture series on the problems facing our economy and security as well as legal remedies, The Purse and the Sword can be found here. While many people are distracted by events in DC, a deeper game is afoot. Last year alone $6.5 trillion went missing from the Federal Government at the same time that the push for a Constitutional Convention increased. With the help of Dr. Vieira’s formidable experience and scholarship, I am sounding the alarm!